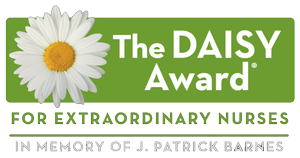 The DAISY Award program for Extraordinary Nurses® is a nationally-recognized award program for nurses. Garrett Regional Medical Center has joined the growing network of 2,000 healthcare organizations across the country that currently participate in the award program created by the Daisy Foundation. The organization’s mission is to recognize the extraordinary, compassionate care that nurses provide patients and families every day. Nurses may be nominated by patients, families and colleagues. A selection committee at Garrett Regional Medical Center will honor several award recipients throughout the year.